specificity of the place including. decoration in many stores and making request production. picture large EMA and Japanism modern picture, and while promoting dedication and cultural inheritance, participating in overseas art festivals. Draw a picture large EMA『御柱大祭行列図』, dedicated it to the god of TAKEI shrine in Nagano prefecture. Draw a picture large EMA 『千歳宮秋季例祭神輿渡御図』, dedicated it to the god of Chitose no Miya in Nagano prefecture. Was invited to Iceland and joined international art festival. Draw a picture 『善光寺参り絵解き図』, and participate in new culture for explanation of picture. Solo exhibition “OZ-尾頭-山口佳祐展” gallery 82, Nagano prefecture. Was invited to Turkey and joined international art festival. Draw a picture large EMA 『東区観音堂今昔絵図』, dedicated it to Tofukuji Kannondo Temple in Nagano prefecture. Won the best award prize of 「RONIN-GROBUS ARTIST IN RESIDENCE PROGRAM」, New York, USA. Was invited to Mexico and performing arts and cultural exchanges through LivePaint and exhibition. Was invited to France and held a performanceand solo exhibition. 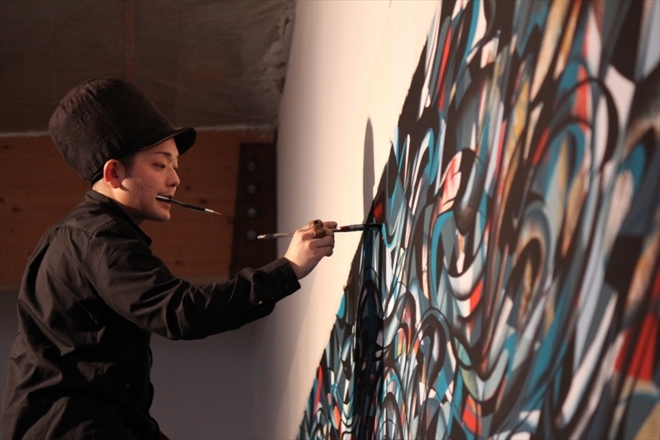 Solo exhibition “mono OZ-尾頭-山口佳祐展”AIN SOPH DISPATCH, Aichi prefecture. Solo exhibition “MONO OZ-Yamaguchi Keisuke Solo Exhibition” Museo Taller Luis Nishizawa, Toluca, MEXICO. Solo exhibition “YAWORAMONO OZ-Yamaguchi Keisuke Solo Exhibition” PARK HOTEL TOKYO | Corridor Gallery 34, Tokyo prefecture. I’m continuing to search for the “something” hidden in all things by blending thoughts and senses peculiar to Japan, traditional techniques with thoroughly modern imagery. His painting brush is still driving now. © OZ-YAMAGUCHI KEISUKE. All Rights Reserved.